We are here to help! On the pages below, you will find useful resources and the answers to some of the most common questions our students’ parents ask us. Happy searching! Is it true that students will receive extra credit for regular attendance? Does Artesia High School allow cell phones and iPods in school? How much does a replacement student identification card cost? State law mandates that children be in attendance during the period when school is in session. Therefore, when a student is absent, the parent shall call the school on or before the day of the absence in order to advise the school as to the reason for the absence if a telephone is available. Zero (0) to one (1) day absent per nine weeks = four (4) points added to nine (9) weeks final average. Two (2) days absent per nine (9) weeks = three (3) points added to nine (9) weeks final grade average. Three (3) days absent per nine (9) weeks = two (2) points added to nine (9) weeks final grade average. We consider a student tardy when he/she arrives to any one (1) of the seven (7) class periods during the school day after the scheduled tardy bell rings. A secondary student (6th-12th grade) may be tardy to any one (1) class, two (2) times per nine (9)-week period, and we will take no action. When a student receives three (3) tardies in any one (1) class, the classroom teacher will send the student to the office, and the school administrator will take appropriate disciplinary action. We ask our students to dress appropriately, as bold outfits can distract from learning. We list our full dress policy in our student handbook, which is located on the Home page under Quick Links. No. If a student is using an electronic device for 5 minutes per class period every day, the student will have missed out on 105 hours (approximately 17.5 days) of engaged learning per school year. 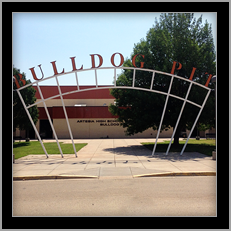 If a parent needs to contact his/her child, please call Artesia High School’s main number (746-9816), and our staff will notify the student to come to the office between classes. If a student needs to contact a parent, the student may do so from the office with teacher permission. All students will receive a student identification card with their picture at the beginning of the school year. All students must have the ID card with them at all times! This card will be used for library privileges. The first card is free. A replacement card cost $5.00.